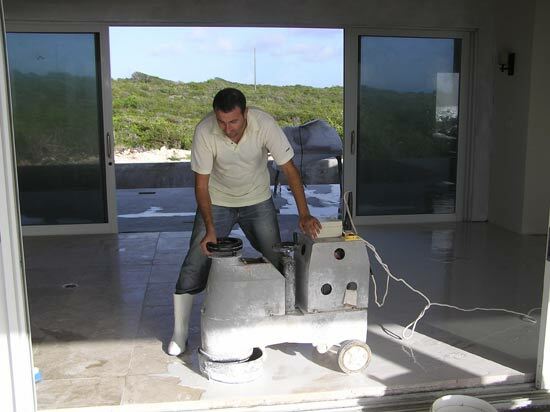 Some contractors choose to install the floor finishing before applying the final wall finishing, others choose to do it after. Each has its advantages. 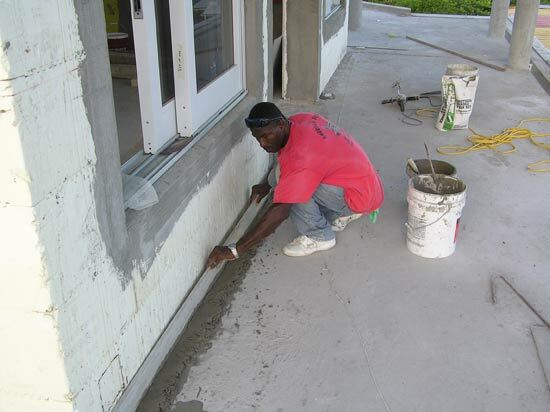 If you choose to finish the walls first, you don't have to worry about using drop sheets or damaging the floor finish. Consequently you may experience collateral damage to the walls when the floor finishing team comes in. Spinning mortar mixers and dirty hands can do a real number on the walls! Mike knew that the tiling team worked carefully and meticulously, therefore we were able to do a combination of both. This really helped scheduling. 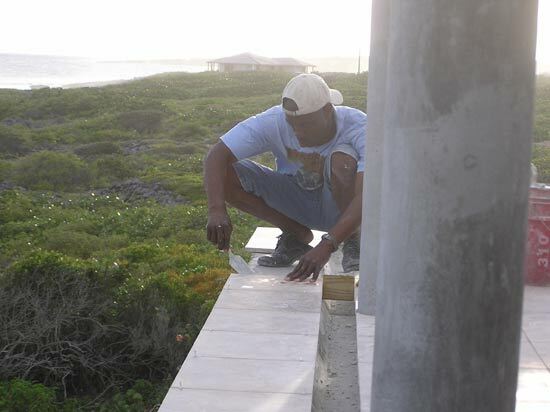 The original team that started the tiling part of the Caribbean construction of our Anguilla home was Glennford Richardson and Tash. In total we had selected two types of floor finishes, rectified porcelain for certain high traffic and high use areas and stone tiles for the balance. In total we ordered over 5,000 square feet of stone tiles from Cleophus at Anguilla Native Stone, this in a 24"x24" format. We wanted to integrate as much of what is local into our home so the choice to use a native stone was natural. This stone is absolutely beautiful and can easily compete with other fine stones from around the world. 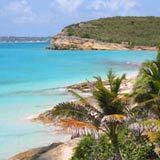 To find out more about Anguilla Native Stone click here. We used the stone on all the terraces as well as interior and exterior steps. We also used the stone in key interior areas that helped tie in the inside and outside spaces. We wanted to create a harmony by bringing the outside in and the inside out. 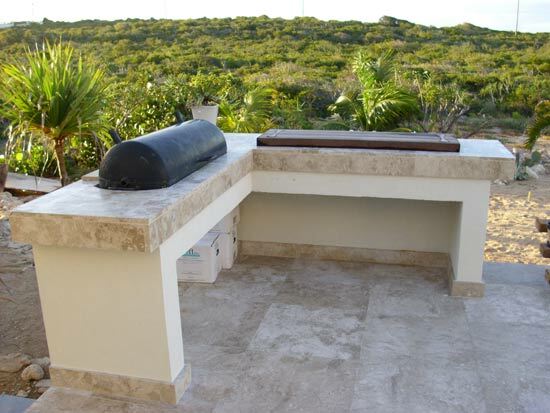 The Anguilla stone was also honed differently at different areas around and inside the house to help accent the spaces. Stone also has a great advantage over ceramic tiles... It does not heat up when the sun beats down on it! 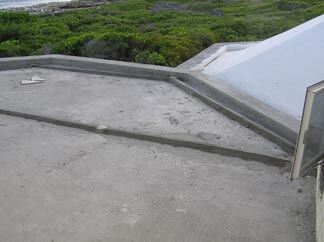 It's perfect to use around swimming pools and other areas where you would be walking barefoot. You don't have to practice your fire walking skills! ;-) And, it's not slippery when wet. 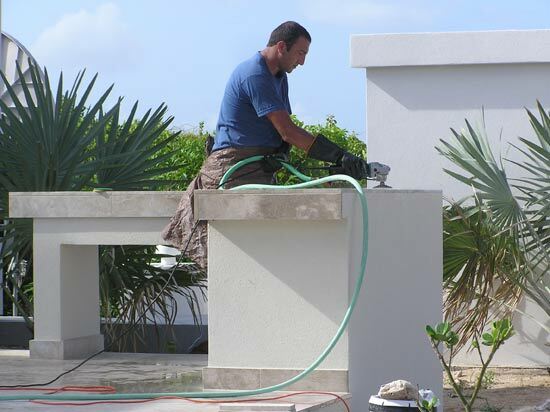 Mike and the team paid special attention and preparation when tiling outside spaces to avoid ponding and to also made sure that there would be the proper slope on the final surfaces to permit proper drainage of rainwater. Sometimes a "capping" is necessary to remedy these issues. 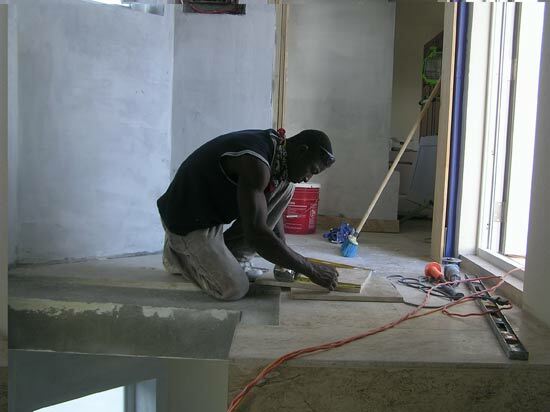 Mike explained that capping is when you place a sand and cement mixture between the concrete slab and the tile in order to raise, level or slope the final floor. The work that Tash and Glennford were doing was looking great and moving along very well. 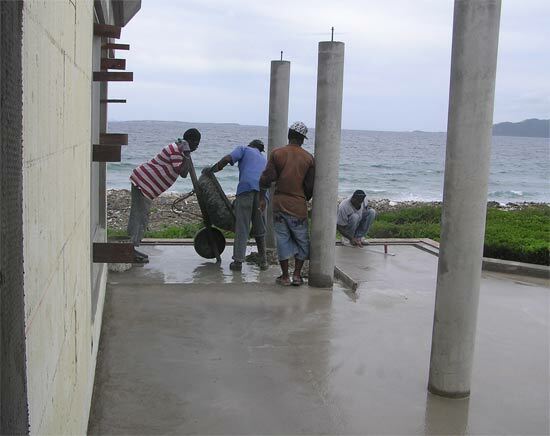 Our Anguilla home was starting to take on a new dimension! Work was moving ahead, but Cleophus hit some stone in his quarry that was not the right hue. We lost a little time waiting for him to move his equipment to another site to find a rock similar to the tiles he sent us the first time. You can never blame a person who's trying to give you the best! Mike got Tony Morton to come in and tile the walls. His patience and ability to work with small tiles preceded him. He was the man for the job! Mike also contracted Emo Reid from Gem Tiles to install the copings and tile the swimming pool area. You have to appreciate and respect how 3 different teams of the same trade can work on the same project in unison. 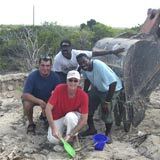 Anguillians are truly easy going and friendly people! 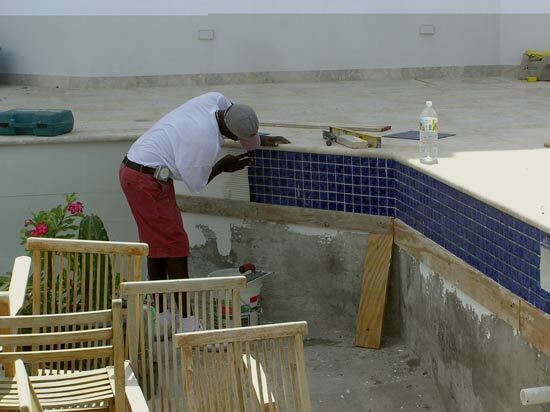 The tilers were even crafty enough to use some of the end cuts from the stone tiles to create shelving, trims around bathtubs and showers and also cover our Anguillian Style Barbeque! The job was finished without a hitch and everything looked great. Now it was time to call back Gareth Hodge to do the swimming pool interior finish (Diamond Brite). Next Step? Onto our Anguilla pool!